As state governments get ready for the roll out of the Goods and Services Tax (GST), which will subsume all indirect taxes imp osed by the Centre, states as well as local bodies, Maharashtra has become the first state to ensure that its urban local bodies (ULBs) do not operate in the red under the “one-nation, one-tax” regime. On May 22, while passing the Maharashtra GST Act, 2017, Ratification Bill, the state government amended it to provide adequate compensation and protection to ULBs as GST kicks in from July 1. ULBs, such as municipalities and municipal corporations, are local self-governments that provide basic community services like healthcare, water supply, educational institutions, housing, transport and waste management. Though they rely heavily on grants-in-aid from the state government to finance their budgets, they are authorised to collect various taxes, such as those levied on property, entertainment, advertisements through hoardings and billboards, and when articles enter the region (Octroi duty or entry tax). These taxes, howsoever meagre they are, ensure the financial auto nomy of ULBs to some extent. A study by the Reserve Bank of India shows that municipalities in the country contribute a mere 0.75 per cent to the GDP, compared to 6 per cent in South Africa. ULBs in states like Maharashtra and Gujarat excel in delivering basic services to urban dwellers because they generate huge revenue and depend less on state grants. The Municipal Corporation of Greater Mumbai earns Rs 7,000 crore a year from Octroi duty alone. But these sources of revenue will dry up with the enforcement of GST. Though the unified revenues would be divided between the Centre and states based on a mutually accepted formula at the GST Council, headed by the Union finance minister, no such formula has been developed for revenue sharing between states and local bodies. This may leave ULBs cash-strapped. This is the reason while amending the GST Bill, during the special session held on May 20-22, Chief Minister Devendra Fadnavis assured that the government would make a financial provision of Rs 15,000 crore to compensate ULBs for their losses. “Maharashtra is an exceptional case,” says Milind Mhaske, project director of Mumbai-non-profit Praja Founda tion that works on urban governance. The promp tness of the state was due to pressure from its main ally, the Shiv Sena which controls the cash-rich BMC. Since local bodies elsewhere have little bargaining power, no other state would make such an effort to ensure their financial autonomy, he adds. With no independent revenue sources and no share in the unified GST revenue, says George Cherian, Director of CUTS International that works on urban governance, ULBs will become weaker and more dependent on state grants. This will stifle their autonomy and lead to weak urban governance. The Union Ministry of Urban Development had highlighted these concerns way back in 2015, when GST was being formulated. It had suggested that 25-30 per cent of the state’s share of GST should directly go to ULBs to compensate them for the huge financial loss they are likely to suffer in the unified tax regime. In August 2016, finance minister Arun Jaitley hinted during a Parliament session that ULBs would continue to collect Octroi duty under the GST regime. But none of the suggestions has been factored into the GST Act. S M Vijayanand, former chief secretary of Kerala, known as one of the architects of the state’s democratic decentralisation initiative, says the GST Council should have had a mechanism in place to either allow the local bodies to collect taxes like Octroi duty or laid down rules for sharing of the GST revenue between states and local bodies. Otherwise, they will never get their rightful share, says Vijayanand, explaining how previous attempts to empower ULBs failed due to lack of clarity in laws. The 14th Finance Commission, which came into being in 2013, recommends states to directly transfer grants meant for local governance to ULBs instead of keeping them waiting for the doles. “But barely two states have acted on it,” Vijayanand adds. Besides, there is no uniformity in taxes collected by local bodies. Entertainment tax, for instance, is collected by local governments in Kerala, whereas it is collected by the state government in Tamil Nadu. “Local bodies will suffer if no clarity is brought into laws regarding devolution of funds,” he adds. Vijayanand, who till August 2015 was the secretary of the Union Ministry of Panchayati Raj (MoPR), had given a presentation to the S S Ahluwalia-chaired Joint Committee on GST, sugge sting that the Act should be drafted in a way that it benefits local bodies. Without a proper mechanism, he adds, states with poor financial condition may deprive local bodies of their rightful share in the unified GST revenue. Shrikanth Viswanathan of Janaagr aha, Bangaluru non-profit that works on urban governance, provides another reason it is important to lay down GST revenue sharing mechanism between the state and local bodies. State legislatures get their power to levy taxes from the Constitution whereas local bodies derive the power from state legislatures. So, while the state government can fight to get a slice of the GST pie from the Centre, local bodies do not even have the authority to negotiate with the state governments for a fair share. “Just as the Centre doesn’t want strong states, they, too, do not want to devolve the power to local bodies,” says T R Raghunandan, former joint secretary, MoPR. 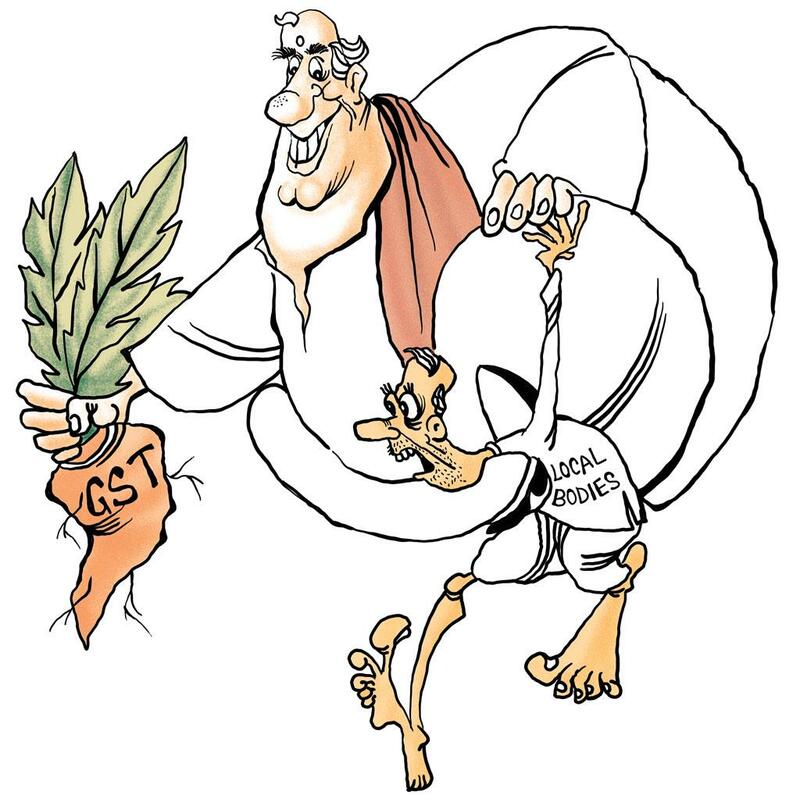 Analysts say while drafting the rules for unified tax system, the GST Council, with all states on its board, has missed an opportu nity to empower local governance. “If states had faith in their local bodies, they would have given at least one per cent of GST to local bodies,” says Ravikant Joshi, Ahmedabad-based urban management and finance expert. “We missed a big chance. GST was an opportunity to empo wer local bodies,” he says. Isher Judge Ahluwalia, chairperson of the Indian Council for Research on International Economic Relations, says even a meagre 0.25 per cent share in GST to local bodies would have helped them improve the delivery of basic services. Infrastructure is developed by the Central and state governments, but service delivery is largely in local bodies’ hands. “Unless you improve their financial condition, service delivery is not going to improve,” she says. Joshi says local bodies are like neglected children. States need to show some maturity to believe in them and the GST Council needs to put in place a formula that enables fair sharing of GST revenue between states and local bodies. Or else, the GST Act would defeat the purpose of the 73rd and 74th amendments to the Constitution, which had formalised local governance in the country, and would lead to centralisa tion of financial power. I am agreed to the points/concerns highlighted in the article and do believe that there is need to look at the present situation of the ULBs in India as the rapid population growth as well as the trend of migration across urban areas will pose alarming situations in near future. I guess the citizen service providers have not been given enough importance under the existing GST regime. The vision of smart cities can not be achieved without improving the financial and administrative structure of the local authorities. The spirit of 73rd and 74th CAA need to be kept while amending the existing provisions envisaged under the GST.